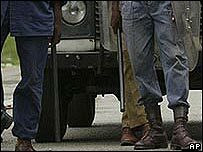 Zimbabwe's parliament is to begin debating proposals to relax tough security and media laws. The opposition Movement for Democratic Change has indicated it might back the changes, which could pave the way for it to take part in elections next year. But MDC spokesman Nelson Chamisa told the BBC that no final agreement had been reached. The government and opposition have been discussing the bills during talks brokered by South Africa. "There is no agreement. What has been there, are paper discussions around issues of elections, around issues of security laws, vis a vis the election environment," said Mr Chamisa, who is part of the MDC faction headed by founding leader Morgan Tsvangirai. Justice, Legal and Parliamentary Affairs Minister Patrick Chinamasa said a caucus of the governing Zanu-PF party MPs had overwhelmingly supported the proposed amendments. The MDC wants a new constitution to be in place before the March polls, while Zanu-PF wants the elections to take place first. The existing laws have been used to block opposition political rallies and to shut down privately-owned newspapers. The proposed amendments concern the Public Order and Security Act (Posa), the Access to Information and Protection of Privacy Act (Aippa) and the Broadcasting Services Act. In terms of the proposed changes, the police would have to give reasons to ban a rally and a magistrate could be asked to overturn a ban. At present, those who intend to organise public meetings, political rallies or demonstrations can only appeal to the minister of home affairs if the police ban their meeting. In March, MDC leader Morgan Tsvangirai was severely assaulted after being arrested for attending a banned rally. 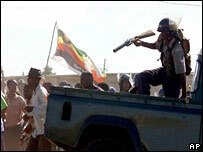 Mr Mugabe later said he had "asked for it" by ignoring police warnings. Official accreditation for journalists will no longer be compulsory, though non-accredited journalists will not have access to official events. Under the existing Access to Information and Protection of Privacy Act (Aippa), journalists can face jail for working without accreditation. There will be also changes to the commission that regulates the country's media. Members of the commission are to be named from a list submitted by a bi-partisan parliamentary committee and should have media experience. Although the media is to be opened to foreign owners, foreign journalists will remain barred from working permanently in the country.